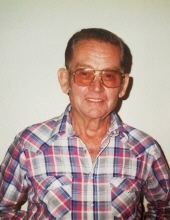 Celebrating the life of Melvin Wayne Dosch Sr.
Obituary for Melvin Wayne Dosch Sr.
Melvin Wayne Dosch, Sr., 91, of Richland Center, passed away April 12, 2019 at Pine Valley Community Village. Melvin was born in Orion Township to Verne and Alma (Epright) Dosch on December 5, 1927. Melvin was raised in Richland County, the youngest of 6 children. Melvin proudly served his country as a part of the U.S. Army, 11th Airborne Division. He was deployed to Japan after the peace treaty for WWll was signed as part of the reconstruction division and was honorably discharged. Upon returning home Melvin farmed in Richland County. Melvin enjoyed hunting, fishing, being outdoors to enjoy the beauty of Mother Nature and traveling around the country. He lived and worked several places. He worked in a brass plating plant in Waterbury, CT; farmed in Richland County, WI; worked for a construction company in Madison running heavy equipment then began his own excavating company near Mazomanie and then moved it to Boaz. He was an excellent carpenter, helping to build and/or remodel many homes and for a few years owned a milk route. When Melvin retired, he moved to Chino Valley, AZ where he bought and remodeled a mobile home, sold that and then moved to Earlboro, OK where he bought property and rebuilt a home. Melvin suffered a stroke in 2010 and was moved to Pine Valley Community Village. While there, Melvin made many friends with the staff and gave them all an education in feeding the gophers. Melvin was married to Winifred L (Miller) Dosch and together they raised 8 children. Survivors include seven children: Allen (Zonita Battershell) Dosch of Surprise, AZ, Deborah Senn of Eden Prairie, MN, Monica (Jim) Deaver of Richland Center, WI, Lynette (Raymond) Lambert of Lansing, NY, Christine (Jarvis) Quenga of Citrus Heights, CA, Melvin Jr. (Jane) Dosch of Ridgeway, WI, John (Mary) Dosch of Wisconsin Dells, WI; 13 grandchildren, 25 great grandchildren, many nieces, nephews, other relatives and friends. Melvin was preceded in death by his parents, son, Warren, ex-wife Winifred, 2 sisters, Marguerite (Kenneth) Sumwalt and Mildred (Lloyd) Burns, 3 brothers, Marvin (Barbara), Marion and Melbourne (Loretta) Dosch. The family would like to extend a special thank you to the caring staff of Pine Valley Community Village for the excellent care given to Melvin during his years there. We will be forever grateful to all the C.N.A’s and the nurses. Melvin loved and cared for all of you like you were his own family. A private family gathering will be held at a later date. The family suggest memorials in Melvin’s name be directed to Pine Valley Community Village or a charity of your choice. The Pratt Funeral and Cremation Service is assisting the family with their arrangements. Online condolences may be made at prattfuneralservice.com. To send flowers or a remembrance gift to the family of Melvin Wayne Dosch Sr., please visit our Tribute Store. "Email Address" would like to share the life celebration of Melvin Wayne Dosch Sr.. Click on the "link" to go to share a favorite memory or leave a condolence message for the family.